The cover features a black and white shot of the band (Magne, Morten, Paul) with trees in the background. The a-ha logo is printed in blueish grey large letters at the top with the title in smaller black font overlapping the bottom of the logo. The 4 page double sided booklet is also black and white with wood / wall texture background. There are no further pictures of the band, only the song lyrics. The disc is a matt blue / grey colour with silver text and the a-ha logo in a slightly lighter shade than the disc and barely visible. The three logos "WE LOVE MUSIC", "UNIVERSAL MUSIC GROUP" and "polydor" are printed in silver at the bottom of the disc. The back sleeve, front and back, features more of the wall texture pattern. The list is printed in large black font down the left hand side of the back cover. 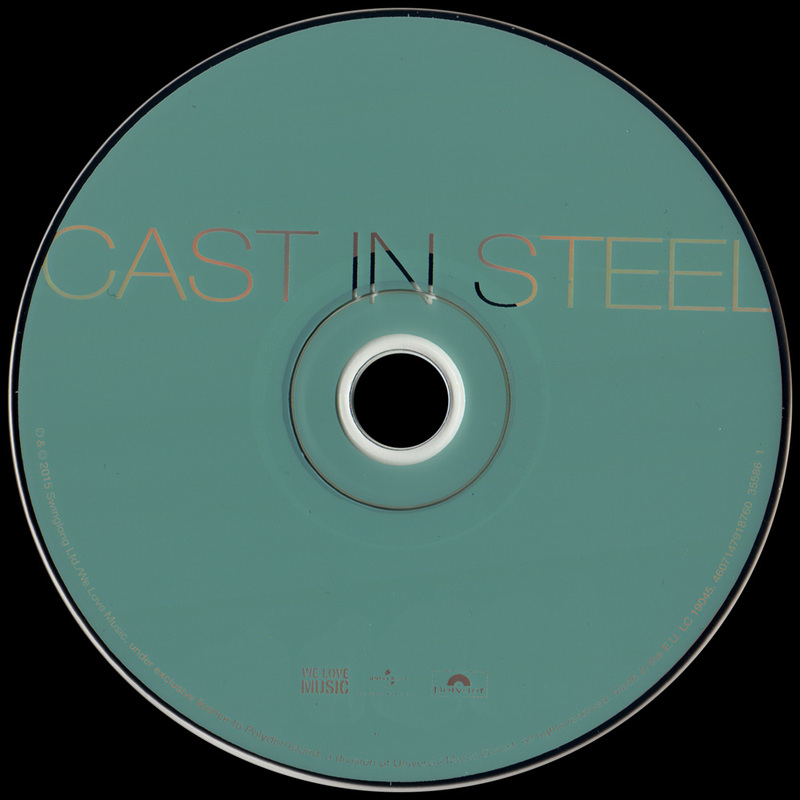 The digipak of "Cast In Steel" with bonus tracks, was available in Europe. The cover artwork is the same as the standard release and comes with a grey rectangular sticker on the front with the text: "DELUXE EDITION THE BRAND NEW ALBUM INCL. BONUS CD WITH ADDITIONAL TRACKS LIVE DATES A-HA.COM 4749844". It comes with a booklet similar to the regular release. Both discs are matt blue / grey colour and a-ha logo plus silver text. The second disc includes the wording "BONUS CD". There is a German/European 180-gram vinyl release of "Cast In Steel" which contains only ten of the regular twelve album tracks compared to the standard CD edition. The LP was released by "We Love Music" and "Polydor". The front sleeve comes with the same artwork as the CD release, including the same black and white shot of the three band members with trees in the background. The a-ha logo is printed along the top, with the album title "CAST IN STEEL" shown in a smaller font and coloured dark grey, overlapping the bottom of the logo. At the bottom left-hand corner of the front sleeve is an additional square aqua coloured sticker with some black text; "THE NEW STUDIO ALBUM 10 BRAND NEW SONGS PLUS DOWNLOAD CODE FOR THE COMPLETE DIGITAL DELUXE VERSION 4749841". The reverse of the sleeve contains the grey and white / wall textured background with the track listing printed in large lettering down the left-hand side. There is some reference to the "Management: Harald Wilk for Scoundrel Days AS" underneath the track listing. Along the bottom of the back sleeve, it displays the "UNIVERSAL MUSIC GROUP", "WE LOVE MUSIC" and "polydor" logos. There is also some additional production and copyright information included; "℗ & © 2015 Swinglong Ltd./We Love Music under exclusive license to Polydor Island, a division of Universal Music GmbH, Stralauer Allee 1, 10245 Berlin. All rights of the producer and of the owner of the recorded work reserved. Unauthorised reproduction, copying, hiring, lending, public performance and broadcasting of this record prohibited. Made in the EU. 06025 4749841 0". There is a white barcode "0 602547 498410" included in the bottom right-hand corner. The inside of the album includes a cardboard inner sleeve displaying all the song words to the ten tracks, the layout and design is like the back sleeve showing the grey and white / wall textured pattern and containing some additional album credits. There is also an additional square grey and white flyer containing the title at the top and a free download code to the "www.umusic.me" online music store. It includes the instructions on how to redeem it, printed in German. The record itself comes with the grey and white textured patterned labels. 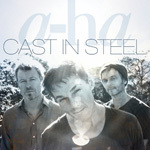 The same layout and colour scheme to the a-ha logo and title "CAST IN STEEL" is displayed along the top. On the left-hand side, it shows either "SIDE A" or "SIDE B" with "33 1/3 RPM" printed underneath. On the right-hand side, the "UNIVERSAL MUSIC GROUP" logo is shown. At the lower half of the label on SIDE A, it lists the tracks; "Cast In Steel, Under The Makeup, The Wake, Forest Fire and Objects In The Mirror", whilst on SIDE B, it lists; "Door Ajar, Living At The End Of The World, Mythomania, Shadow Endeavors and Goodbye Thompson". The catalogue number 06025 4749841 0 and LC 19045 coding is included at the bottom of each side. Around the bottom outer rim of the label (again on both sides) is some production and copyright text which is similar to that shown on the back sleeve; "℗ & © 2015 Swinglong Ltd. /We Love Music, under exclusive license to Polydor/Island, a division of Universal Music GmbH. All rights reserved. Made in the EU. BIEM / SDRM." There is a limited deluxe digipak edition which comes in a 7" x 7" metal tin. The lid of the tin has the same cover art as the regular release. Inside the tin is the digipak version of "Cast In Steel" (as described above), a 42cm square poster of the album cover and a 16cm square metalllic postcard of the band (Paul, Morten, Magne). A paper sheet is stuck on the bottom of the tin which is similar to the back sleeve of the regular release with track listing plus additional information on the contents of the box plus the Universal Music Catalogue logo. The UK promo comes in a PVC sleeve with a folded paper insert. The front of the sleeve is similar to the regular album. The back sleeve is white with the a-ha logo at the top and title; "CAST IN STEEL", It also includes the "Release date 4th September 2015" printed underneath. The full 12 track listing is displayed down the centre with a credit's name and number to "53. Robert Elms" (English Writer and Broadcaster) shown on the lower left hand side. Along the bottom, there is a "UNIVERSAL MUSIC CATALOGUE" logo plus some Promotional and Watermark text; "FOR PROMOTIONAL USE ONLY – NOT FOR SALE. THIS CD CONTAINS A UNIQUE WATERMARK TRACEABLE TO THE RECIPIENT". On the back of the clear PVC wallet there is an Orange rectangular sticker which displays some history of A-ha and there upcoming tour dates, including the 30th anniversary of the Rock in Rio music Festival in Brazil during September. There are also some "HESSO MEDIA" contact names, telephone numbers and email addresses; "a-ha – ‘Cast In Steel’ (Album) Release Date: 4th September. 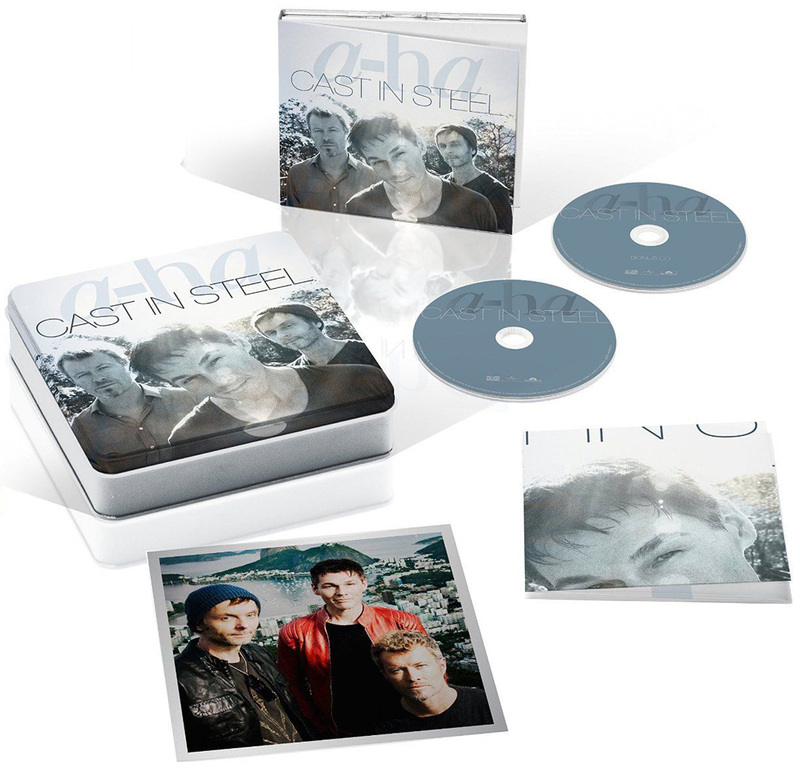 ‘Cast In Steel’ is the new album from iconic Norwegian band a-ha, released on Universal. The release is a-ha’s 10th studio album and the first new material since the critical and commercial success of 2009’s Foot Of The Mountain’. The album features 12 brand new compositions including the BBC Radio 2 A-Listed single ‘Under The Make Up’ and the band’s follow up single ‘The Wake’. To date a-ha’s success has seen them reach multi-platinum sales of more than 35 million worldwide. The announcement follows the news that the band will celebrate the 30th anniversary of the Rock In Rio music Festival in September, which coincidentally falls thirty years since their debut single ‘Take on Me’ which reached #1 globally. A-ha will also embark on an international tour in 2016 which includes a gig at the London O2 Arena. CHRIS HESSION 07793 630 426 [email protected] TOM POOLE 07852 426 555 [email protected]". The "HESSO MEDIA" logo is additional shown at the bottom right hand corner. 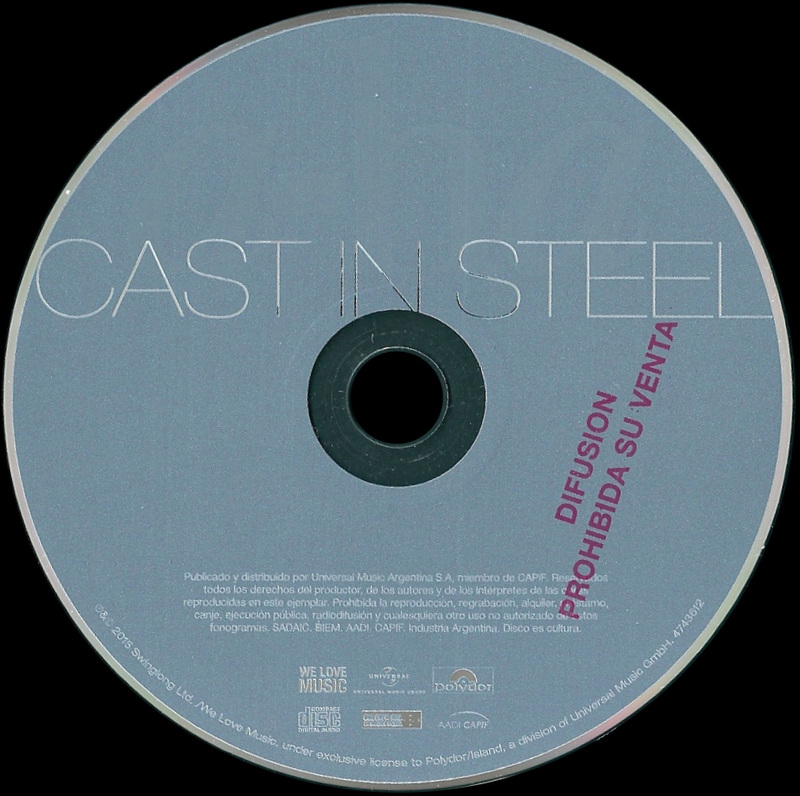 The promo comes with a silver disc with black printed text, the a-ha logo is displayed at the top with the title "CAST IN STEEL" in large lettering underneath. At the lower half of the disc, it displays the same text as on the back sleeve, including the credit to "53. Robert Elms", Promotional and Watermark Information and "UNIVERSAL MUSIC CATALOGUE" logo. The release appears to come without a Catalogue number. There is also a promotional release of the European made "Cast In Steel" deluxe digipak edition which was used for the UK market and comes additionally with a large black and white rectangular "nonstop promotions" sticker stuck on the inside of the front sleeve. It displays the UK release dates for some of the singles taken from the album; plus also makes reference to the four tour dates in the UK and the 30th anniversary of the Rock in Rio music Festival. Some Record Company contact names, telephone numbers and email addresses are also included; "nonstop promotions A-HA SINGLE 1: ‘UNDER THE MAKEUP’ – 28 AUGUST SINGLE 2: ‘THE WAKE’ – IMPACT 11 SEPTEMBER ALBUM ‘CAST IN STEEL’ – 4 SEPTEMBER. A-ha, the multi-platinum selling legendary Norwegian band, have confirmed their temporary return with the release of their first new material for six years ‘Cast In Steel’. ‘Cast In Steel’ is the band’s tenth studio album, and the first new music by the group since the critical and commercial success of 2009’s ‘Foot of the Mountain’. The band will celebrate the 30th anniversary of the Rock in Rio music Festival. Featuring 12 brand new A-ha compositions, including the BBC Radio 2 ‘A-listed’ Under The Makeup, the album was recorded in Oslo, Stockholm and New York. Four date UK tour confirmed for March 2016. Niki Sanderson | Stuart Kenning | Emma Williams 0 20 8334 9994 / [email protected] / @NonStopTV". The regular 10 track jewel case edition of "Cast In Steel" was released in Argentina and comes with the usual front cover artworks. On the back sleeve there is some Argentine publishing, distributing and copyright text displayed along the bottom mainly in Spanish which reads; "℗&© 2015 Swinglong Ltd. /We Love Music, under exclusive license to Polydor/Island, a division of Universal Music GmbH. Publicado y distribuido por Universal Music Argentina S.A. miembro de CAPIF. Reservados todos los derechos del productor, de los autores y de los interpretes de las obras reproducidas en este ejemplar. Prohibida la reproduccion, regrabacion, alquiler, prestamo, canje, ejecucion publica, radiodifusion y cualesquiera otro uso no autorizado de estos fonogramas. SADAIC. BIEM. AADI. CAPIF. Industria Argentina. Disco es cultura. 4743612". Also included at the lower right hand corner of the back sleeve above the regular white barcode is the usual "UNIVERSAL MUSIC GROUP", "WE LOVE MUSIC" and "polydor" logos, plus some additional ones; "COMPACT disc DIGITAL AUDIO", "UNA COPIA MAS, UN MUSICO MENOS. CAPIF" and "AADI CAPIF".The usual "Management: Harald Wiik for Scoundrel Days AS" credits and "a-ha.com" website address are also shown. The inside of the CD also includes the regular full track lyric booklet which is exactly the same as the UK edition apart from the Catalogue number on the back page has been changed to 4743612. The disc is coloured plain grey (rather than the usual matt blue/grey) and displays the title "CAST IN STEEL" in silver at the top overlapping the grey "A-ha" logo. At the lower half of the disc again printed in silver is the same publishing and copyright information which appears on the back sleeve, plus same Record Company and "COMPACT disc DIGITAL AUDIO" logos. The distributing text; "℗&© 2015 Swinglong Ltd. /We Love Music, under exclusive license to Polydor/Island, a division of Universal Music GmbH." and Catalogue number 4743612 is also shown around the outer bottom edge of the disc. The promo Argentinian made CD comes with an additional purple promo stamp on the disc which reads; "DIFUSION PROHIBIDA SU VENTA". The Brazilian release was produced by "NovaDisc under license to Universal Music International Ltda" and comes with the regular front cover artworks similar to the European release. On the back sleeve, the Manufacturing, Distributing and Copyright information displayed along the bottom is different and reads; "060254743612 • (P)&© 2015 Swinglong Ltd. /We Love Music, under exclusive license to Polydor/Island, a division of Universal Music GmbH. All rights reserved. LC 19045 Produzido por NovoDisc Midia Digital Ltda. Av. Guarapiranga, 1671 – Sto. Amaro – Sao Paulo – SP CNPJ: 02.073.507/0001-09, sob licence de Universal Music International Ltda. – CNPJ:08.975.642/0001-18. • www.universalmusic.com.br • denuncle a pirataria: www.apdif.org.br". The back sleeve also shows the full track listing down the left hand side and includes the regular white barcode which includes the same number as the UK edition, but is set out slightly differently; "6 02547 43612 2". The usual "Management: Harald Wiik for Scoundrel Days AS" credit text is shown, along with the regular "WE LOVE MUSIC", "polydor" and "UNIVERSAL MUSIC GROUP" logos, an additional "COMPACT disc DIGITAL AUDIO" logo has also been included. The disc itself is similar to the European pressing but appears to be coloured slightly darker and includes some Portuguese text. the usual virtually non-existant a-ha logo is displayed at the top with the title "CAST IN STEEL" printed in white and overlapped underneath. At the lower half of the disc, it again displays the "WE LOVE MUSIC", "UNIVERSAL MUSIC GROUP", "Polydor" and "COMPACT disc DIGITAL AUDIO" logos which appear additionally on the back sleeve. The same Manufacturing, Distributing and Copyright information has again been printed around the bottom outer edge of the disc but some additional Portuguese text has been included. There are at least three issues of this Brazilian "NovoDisc" pressing known to exist, but come with a different batch issue coding printed at the bottom right hand corner of the back sleeve and around the centre ring of the disc;- AA0003000, AB0003000 and AC0001500. The German limited deluxe edition of "Cast In Steel" is similar to the UK edition, but comes with an additional grey and white a-ha "Fan Pass" lanyard for early access to the 2016 German leg of the tour. The lanyard features the "Cast In Steel" artwork on the front and information about the pass in German on the reverse. The paper sheet on the reverse has details of the contents of the box, including the lanyard and has the Polydor logo rather than the Universal Music Catalogue logo. There is a standard 10 track Norwegian jewelcase edition of "Cast In Steel" which is similar to the UK edition but comes with a different catalogue number 602547488183. On the back sleeve, the distributing information is also different and reads; "℗&© 2015 Swinglong Ltd. under exclusive license to Universal Music AS, Norway". The regular credits information; "Management: Harald Wiik for Scoundrel Days AS" and "a-ha.com" website address are shown. At the bottom right hand corner, a white barcode is included but again displays a different number "6 02547 48818 3" compared to the UK edition. The "UNIVERSAL MUSIC GROUP" logo is also present, but there is no "WE LOVE MUSIC" or "polydor" logos. 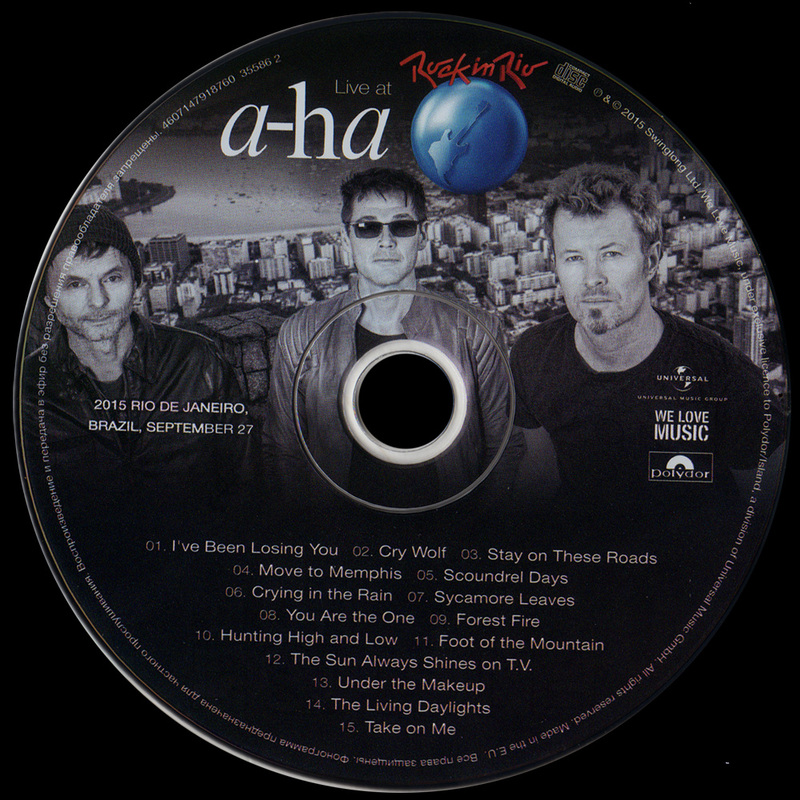 The disc itself is also coloured matt blue/grey but is slightly darker than the UK release and includes white printed text rather than the usual silver, making the layout much clearer, the "a-ha" logo with the overlapping title "CAST IN STEEL" is displayed at the top, with the "UNIVERSAL MUSIC GROUP" logo, same distributing information and Catalogue number which appears on the back sleeve is printed at the bottom. The release also appears to come with a lyric booklet. There is another Norwegian jewelcase edition of "Cast In Steel" which comes instead with 13 tracks to include the bonus track "The End Of The Affair". On the back sleeve, the full 13 tracks are listed down the left hand side, along with the same credits information; "Management: Harald Wiik for Scoundrel Days AS" and "a-ha.com" website address which appears on the standard 10 track edition. Along the bottom there is a different Catalogue number 602547488237 compared to the standard edition, although the distributing information; "℗&© 2015 Swinglong Ltd, under exclusive license to Universal Music AS, Norway" is the same. The regular "UNIVERSAL MUSIC GROUP" logo has again been displayed but the "WE LOVE MUSIC" and "polydor" logos have been omitted. The white barcode is also included in the bottom right hand corner but again comes with a different number "6 02547 48823 7" compared to the standard release. The disc itself, like the standard Norwegian release is also coloured matt blue/grey again slightly darker than the UK release and includes white printed text rather than the usual silver, the "a-ha" logo with the overlapping title "CAST IN STEEL" has again been displayed at the top, with the "UNIVERSAL MUSIC GROUP" logo, same distributing information and Catalogue number which appears on the back sleeve printed at the bottom. The regular inner lyric booklet is included inside but the layout of the back page has been changed to additionally include the lyrics to the Bonus track "The End Of The Affair", full album credits and "℗&© 2015 Swinglong Ltd. under exclusive license to Universal Music AS, Norway." distributing text. "Cast in Steel" was also available onto 180-gram vinyl in Norway; it comes with the same regular front and back cover artworks as the German/European LP edition, but includes instead a different black and white sticker located in the bottom right-hand corner. 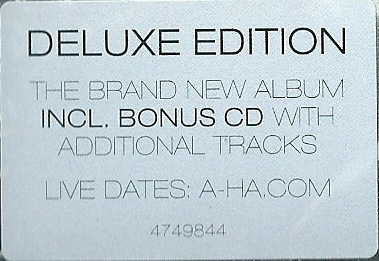 Like the German/European edition, the sticker contains a free digital download code of the album; "a-ha TO CLAIM YOUR 12 TRACK DIGITAL VERSION OF a-ha “CAST IN STEEL” PLEASE VISIT http://www.universalmusic.no/cisd/ AND ENTER THE CODE BELOW Ei4y988U892B60JQA". On the back sleeve, the same ten only tracks, which appear, on the German/European edition are printed in grey and listed down the left-hand side. The text; "Management: Harold Wilk for Scoundrel Days AS" is also shown under the track listing. The LP was manufactured and released by Universal Music in Norway and includes the "UNIVERSAL MUSIC GROUP" logo and text; "℗ & © 2015 Swinglong Ltd, under exclusive license to Universal Music AS, Norway 602547492074" printed in the bottom left corner. The usual "WE LOVE MUSIC" and "polydor" logos which appear on the German/European edition are not present. There is a barcode additionally included in the bottom right-hand corner but coming with a different number "0 602547 498410" compared to the German/European release. 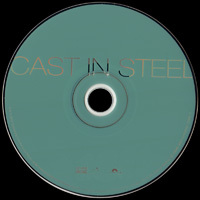 The regular jewelcase edition of "Cast In Steel" was available in Poland. It is very similar to the regular European edition but has a different catalogue number and comes with a sticker on the front. \ Two different stickers were used, one is a round red, white and blue "ZAGRANICZNE PEYTY" sticker with yellow stars around the edge, there is also a white rectangular sticker which displays four logos "radio ZET chilli", "TVP KULTURA", "KINOPOLSKA MUZYKA" and "MAGAZYN SUKCES". The other sticker is a long thin dark blue sticker with white text: "PIERWSZY OD PONAD 5 LAT, PREMIEROWY ALBUM a-ha !" plus 14 small logs. The standard 12 track Russian CD release of "Cast In Steel" comes additionally with a large blue and grey obi-strip. Along the top on both the front and reverse of it, there is a blue stripe with the text; "+ ПОЛНЫИ БУКЛЕТ 8 СТРАНИЦ" printed in white which translates to; "FULL BROCHURE 8 PAGES". The remainder of the obi has a grey background with blue text. There is a white a-ha logo printed on the front with the title "CAST IN STEEL" in blue, plus the Russian slogan shown in the centre; "ДОЛГОЖДАННЫЙ НОВЫЙ АЛЬБОМ ВОССОЕДИНИВШИХСЯ ПИОНЕРОВ ЖАНРА ЭЛЕКТРО-ПОП" which refers to; "Long awaited new album uniting the pioneers of the genre electro-pop". Displayed at the bottom is a black and orange coloured logo on a white background advertising the Russian Radio Station "on seven hills". The obi spine has the title "a-ha CAST IN STEEL" displayed landscaped in blue with the "Warner Music Group International" logo shown orientated in black at the bottom. The obi back comes with two pictures advertising albums by other artists; "IMAGINE DRAGONSS «SMOKE + MIRRORS»" and "BECK «MORNING PHASE»", it also includes some Russian information relating to both these bands. There is a large white barcode displayed at the very bottom which comes with a different number "4 605026 716063", plus includes the text; "Все самые последние новости об артистах и новых альбомах на сайте" printed in white and on a blue stripe, when translated it reads; "All the latest news about artists and new albums online". The Russian facebook website address is additionally shown; "www.facebook.com/universalmusicrussia". The album itself comes with the regular front and back cover artworks, it additionally displays a silver "UNIVERSAL 000 «Юниверсал Мьюзик»" hologram sticker with some black coding; AE 063156 on the actual front of the CD case. On the back sleeve, there is some Russian manufacturing and copyright text; "℗© 2015 Swinglong Ltd. /We Love Music, under exclusive license to Polydor/Island, a division of Universal Music GmbH. ©℗ 000 «Юниверсал Мьюзик» 2015., Россия, 121170, г. Москва, Кутузовский проспект, Д.36, строение 23, Изготовители; 000 «Уральский злектронный Завод», Россия, 620137, г. Екатеринбург, ул. Студенческая, д9, корпус 11-А лицензия ВАф № 77-15. 000 «Хай-Тек Медиа Клуб» 129090, г. Москва, Щепкина ул., д.28, лицензия № 77-340 от 20.12.2010 г. фонограмма предназначена для частного прослушивания. Иное использование Без разрешения правообладателя запрещено. Компакт- диск формата CD-DA Содержит музыкальную запись. Не подлежит обязательной сертификации. Соответствует стандарту Red Book (Красная Книга), стерео. Не подвергать механическому воздействию. Лицензионный диск, произведенный в России, для распространения на территории СНГ, исключая территорию Молдовы. Все права защищены. По вопросам оптовых закупок: тел. (495) 737-0090, e-mail: [email protected] | www.facebook.com/universalmusicrussia". The regular "WE LOVE MUSIC", "polydor" and "UNIVERSAL MUSIC GROUP" logo's are shown along with the credits; "Management: Harold Wiik for Scoundrel Days AS". Like the obi-strip, the barcode number has again been displayed on the back sleeve. The inside of the CD comes with the regular 12 track lyric booklet but the catalogue number printed on the back page has been changed to "4605026716063", plus the inside of the back cover also has a purple tinge to it compared to the UK release. 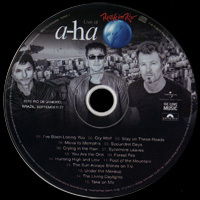 The disc comes with the regular bluish/grey background, but instead shows white printed text (rather than silver), the virtual non-existent a-ha logo is as usual displayed at the top. At the lower half of the disc, the three regular logos are also present but are displayed slightly larger than on the UK release. Around the outer bottom edge of the disc is some additional Russian distributing and copyright text; "℗© 2015 Swinglong Ltd. /We Love Music, under exclusive license to Polydor/Island, a division of Universal Music GmbH. ©℗ 000 «Юниверсал Мьюзик» 2015 Все права защищены Фонограмма предназначена для частного прослушивания. 4605026716063". There is also a Russian deluxe 2-disc set which has a similar front and back cover to the UK deluxe digipak edition but comes instead with a Bonus picture CD containing the live broadcast by "AOL" of a-ha in Concert on the 27th September 2015 at ROCK IN RIO in Brazil. The release appears to be unofficial. There is a grey printed stripe down the left hand side of the front cover with some black text which reads; "DELUXE 2-DISC SET THE NEW STUDIO ALBUM 10 BRAND NEW SONGS PLUS BONUS TRACKS + BONUS CD Live at ROCK IN RIO 2015 RIO DE JANERO BRAZIL, SEPTEMBER 27". On the spine and back sleeve, the background colouring has been printed in grey instead of the usual white. The layout on the spine comes with the regular title "a-ha CAST IN STEEL" displayed landscaped in the centre with the wording "UNIVERSAL" on the right hand side. The Catalogue on the left hand side has however been changed to "4607147918760". The back sleeve apart from the grey background colour comes with the same layout as the UK deluxe digipak release, showing the full audio track listing including bonus tracks down the left hand side. There is no mention or reference otherwise to the bonus CD part of the album. The regular "WE LOVE MUSIC", "polydor" and "UNIVERSAL MUSIC GROUP" logos are included along with the credits; "Management: Harold Wiik for Scoundrel Days AS" and "a-ha.com" website address. Along the bottom, the usual European manufacturing and copyright information is shown; "℗ & © 2015 Swinglong Ltd./We Love Music, under exclusive licence to Polydor/Island, a division of Universal Music GmbH. All rights reserved. Made in E.U. LC 19045." and doesn’t include any Russian text. There is a white barcode included at the bottom right hand corner but the number has again been amended to "4 607147 918760". The inside of the digipak folds out and comes with two clear plastic trays to fit both the 2 CD discs, it also doesn’t include the regular lyric booklet, the full album credits have instead been printed on the left hand side. There are some additional artworks included inside showing a picture (split in two) of the three band members taken from a photo shoot when appearing in Brazil back in 2015 at the announcement of the Rock In Rio 30th anniversary, this picture doesn't appear on the UK release. I’ve Been Losing You 02. Cry Wolf 03. Stay On These Roads 04. Move To Memphis 05. Scoundrel Days 06. Crying in the Rain 07. Sycamore Leaves 08. You Are the One 09. Forest Fire 10. Hunting High and Low 11. Foot of the Mountain 12. The Sun Always Shines on T.V. 13. Under the Makeup 14. The Living Daylights 15. Take on Me. Around the outer edge of the bonus disc is an additional "COMPACT disc DIGITAL AUDIO" logo, plus some distributing and copyright text which is printed in both English and Russian; "℗ & © 2015 Swinglong Ltd./We Love Music, under exclusive licence to Polydor/Island, a division of Universal Music GmbH. All rights reserved. Made in the E.U. Все права защищены Фонограмма предназначена для частного прослушивания.Воспроизведение и передача в зфир без разрешения правообладателя запрещены. 4607147918760 35586 2". The Ukrainian release was released by "Comp Music Ltd. under license to Universal Music GMBH" and comes with the regular front and back cover artworks but the manufacturing and Record Company contact details at the bottom of the back sleeve are printed in Ukrainian; "℗&© 2015 Swinglong Ltd. /We Love Music, under exclusive license to Polydor/Island, a division of Universal Music GmbH. All rights reserved. LC 19045 ліцензіат Universal Music Group в Украіні - компанія Comp Music Ltd. Ліцензійна угода з Universal Music Group від 01.01.2014 Музичний компакт-диск формату CD-DA. Вироблено в Україні тов "Комп Мюзік" Україна, м, Киів-1, 01001, пров, Михайлівський 9-91, тел./Факс: (044) 537-3661, продаж - [email protected] www.compmusic.kiev.ua Дата виготовлення 04.09.2015 р. Зберігати при температурі від до - 10 +30, Тривалість звучання 48 хв. ТОВ «Комп Мюзік» гарантує якість товару та здійснює прийняття претензій від споживачів та ремонт і технічне обслуговування. Строк придатності необмежений. The three usual "WE LOVE MUSIC", "polydor" and "UNIVERSAL MUSIC GROUP" logos are displayed at the bottom right hand corner of the back sleeve, along with regular white barcode which includes the same number "0 602547 436122" as the UK release. There is an additional rectangular silver control mark "контрольна марка" hologram sticker also included with A-HA "Cast In Steel" and the coding "K 102662 33" printed in black. The disc itself differs from the UK release and is grey (rather than blue) and comes with a mixture of silver and grey text. The a-ha logo is also printed in grey at the top making it virtually non-existant, with the title "CAST IN STEEL" as usual shown in silver above the centre ring. At the lower half of the disc, there is some Ukrainian Copyright information which is printed very faintly and reads; "Небпавомірнс відуворення розповсюдження здавання в майновий найм (оренду), комерційний прокат трансляція через ефір та публічне сповіщення без дозволу правовласника заборонено. Всі права дотримано. Дли розповсюдження тільки на території України". It also displays that the CD is "Under license from UMG Recordings Services INC.", and "Not for sale outside Ukraine". The three regular "WE LOVE MUSIC", "UNIVERSAL MUSIC GROUP" and "polydor" logos are also shown in silver and included at the bottom. Around the outer edge of the disc is the standard European distributing text; "℗&© 2015 Swinglong Ltd. /We Love Music, under exclusive license to Polydor/Island, a division of Universal Music GmbH. All rights reserved. LC 19045. 06025 4743612 2". The inside of the CD comes with the same Lyric booklet as the UK release, but at the bottom of the back cover it again additionally displays the "UMG Recordings Services INC." licensing text and that the CD is "Not for sale outside Ukraine". On the inside of the back cover, it has the wording; "Ukrainian special edition COMP MUSIC" printed which can be seen through the front of the spine. The release also comes with the same Catalogue number as the UK edition 06025 4743612 2.